I was planning to celebrate the New Year at a club in Taksim, the busiest nightlife district in central Istanbul. I had even signed up beforehand to the party. 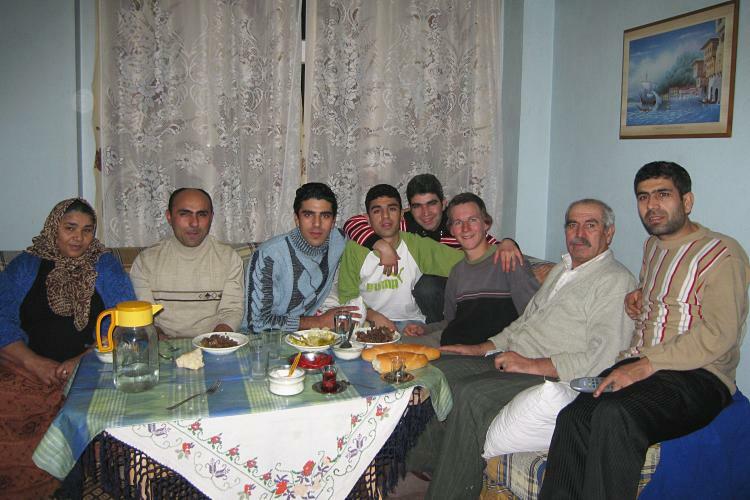 However, the unexpected happened again and I found myself as the honoured guest in a Turkish family living in an eastern suburb of the city. None of them even spoke any English, but it didn't stop them to treat me with all the food, love and care they had. The story actually begins already December 19 when I was leaving Istanbul for going to Ankara. The train station is on the Asian side of the Bosphorus and I planned to take a ferry there around nine o'clock, in order to catch a train leaving an hour later. However, at the ferry docks I noticed that the last ferry to the right place had left 20 minutes ago. Well, I took another one which brought me to a couple of kilometers away and started walking towards the station. I could have taken a taxi but didn't want to spend extra on that. I had not yet bought the train ticket and there was still a later train the same evening if I'd miss the one I intended to take. I didn't need to walk long until two guys driving a city cleaning department pickup truck stopped by and waved me to hop in. I managed to explain where I'm going and got a ride to the train station. One of the guys even helped me find the ticket counter and train. Then I got the phone number of one of the guys, Ali, and he asked me to call when I'd be coming back. I'd get another ride and we could have a cup tea together, they said. When I was boarding the train in Ankara eleven days later I remembered Ali and wondered whether I'd bother him again. The request to call had sounded genuine and even enthusiastic so I decided to give it a go. I sent a message saying that I'd be arriving the following morning. In the morning he wasn't at the station but gave me a short call at the designated time. After a couple of unsuccesful attempts to communicate without a common language I found a friendly person at the station who helped to translate. We decided to meet at the same place at 17:00 the same day. I was there at the agreed time and so was Ali, again driving the same small truck. Then off we drove, pedal to the metal, picking up some other workers and dropping them home, and ending up to a city truck depot where Ali left the vehicle. From there we hitchiked, walked, ran and took a bus east, finally arriving to a house where Ali's family was waiting for us. It was a big family. If I understood correctly Ali had five brothers and one sister. Four of the brothers were present, two with their wifes and small kids, and either all five (including Ali) or at least most of them also lived under the same roof with the parents. Now all had gathered to the living room to celebrate the first day of Kurbam Bayramı, one of the big muslim festivals which happened to co-occur with New Year's eve this time. We had a meal which consisted of meat, cabbage, youghurt, hot chilis, bread and of course tea. For the dessert there was a huge plate of home made baklava and different kinds of fruit. Other program of the evening included watching Ali's photos from his military service period, watching my photos from Finland, chatting (as much as we could with the limited common language) and watching television. A small funny bit for me was that the Santa Claus appeared in the New Year TV show, and Turkish people actually often call that day Christmas. Alcohol was not part of the celebration in this family: everybody was drinking only water, tea or soft drinks. I also took a shower and my hosts insisted to wash my jacket, which they found dirty. ;) We went to sleep around one o'clock and in the morning I was again treated to a sumptuous breakfast. Then I returned to the European side of Istanbul and to my hostel accompanied by Ali, who thereafter needed to go to work again. Right after the New Year I caught a bad flu and spent a couple of days mostly in bed. Now I've mostly recovered but still coughing and sneezing frequently. However, sick or not, today is my last day in Istanbul. In a few hours I'll pack my stuff and ride to the airport, where I'll be boarding a flight to New Delhi, India at 02:15. I hope everything will go well and both me, my bicycle and other luggage will arrive there safely. Riding the bicycle in New Delhi may be challenging to say the least, so this time I'm not planning to simply load the panniers on the bike, get out of the airport and head to the city. Instead, I should be having a taxi waiting for me at the airport and a place to stay for the first couple of days. This way I can take it easy upon arrival and see later whether and where in India I can actually continue cycling. More about that later. 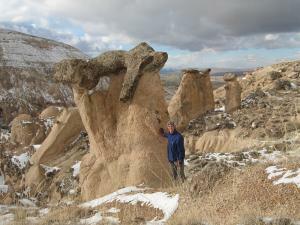 I decided to spend Christmas 2006 in Cappadocia, central Turkey. It's an area where volcanic activity long ago created a bizarre landscape, and people have later contributed to that by digging an incredicble number of cave houses, churches and other holes in the soft rock. Some of the cave house complexes are organized as museums. They were certainly interesting, but still better was to explore those which were just scattered around the edges of villages or waiting for visitors in the middle of nowhere. I enjoyed climbing on top the hills about five kilometers from the town of Ürgüp and admiring the landscape which had just been covered by a thin layer of fresh snow. Descending on the other side I arrived to a forest of funny towers and stone mushrooms, shown in the picture on the right. It was funny that I was a few thousand kilometers south from my homeland but it was colder than in most parts of Finland. Temperature in Cappadocia was generally a few degrees below zero, at nights dropping to -10°C and below. On Christmas eve and day the ground was still bare, snow arrived in the morning of December 26. My Chrismas eve dinner was Turkish food at a local restaurant in Ürgüp with Yuko, a Japanese friend whom I'd met earlier in Istanbul. After some soup and salad we ordered the local speciality Testi Kebab without really knowing what we're going to get. It turned out to be a pretty tasty meat and vegetables stew cooked inside a closed clay pot, which was broken in front of us to release the food from inside. The local red wine wasn't that great, white one which we had with our starters was better. For the dessert we had a plate of baklava (Turkish sweets) and tea. It was a nice and relaxed evening. I celebrated Chrismas also by staying in a slightly better than usual (although not exceptional) hotel and going for a soak and massage in a hamam, a Turkish bath, on Christmas day. Most of the presents and cards which I'd sent from Istanbul didn't arrive in time, but I called my family and grandparents to say hello. My own best Christmas present, however, was the visa to India, which I was able to finally pick up at Ankara on December 29th. This year I'll celebrate the Christmas in Turkey, far away from my family and traditions in Finland. It has been refreshing to spend one December without being surrounded with Santa Claus decorations and Jingle Bells songs everywhere. It hasn't been a complete escape however: I devoted one day to shopping for presents and a couple of evenings to writing postcards. Nowadays streets in Turkish cities are lined with small western-style shops, but markets and bazaars are still the liveliest places to shop. There you'll find also the best prices for fresh food, sweets, spices and many other things, after some negotiation of course. So I also headed to the most famous of them all, the Grand Bazaar in Istanbul. Every shopkeeper knew at least "Hello", "How are you doing", "Where are you from" and numbers in English. As a proof of success of the tourism industry, surprisingly many could even produce a greeting in Finnish. Then some would actively start pushing their merchandise while others would let you wander around and take a more relaxed look. Perhaps needless to say that I preferred the latter. Of course I'd also engage in conversations which are part of the bazaar experience, but the more fruitful talks never started with "Would you like X? No. How about Y? No...". Having a couple of photos of my trip handy turned out to be useful: they spurred also some genuine interest beyond just getting my money. 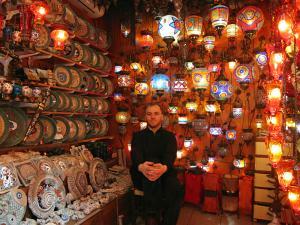 The lamp shop owner in the picture taught me some Turkish in return — and got a deal too. However, all in all I cannot say that I really enjoyed my time in the Grand Bazaar. More pleasant experiences were the Spice Bazaar and other smaller bazaars and markets in Istanbul and Ankara. They were full of locals unlike the touristy Grand Bazaar. There was also shouting and pushing going on but it was different, because buyers generally knew what they wanted. Shopkeepers would also more readily give out free goodies for tasting and offer tea, especially in less touristy Ankara. Ankara is far behind of Istanbul in the number of historical sights and lacks the attractive location by the sea, but it compensates with a generally more friendly atmosphere and less tourist scams. Even taxi drivers waved me to have tea with them without intention to make me take a taxi. And the landscape isn't bad either: the view from Atakule tower towards the mountains in the north is pretty amazing on a clear day. Ankara is also the prime city to become familiar with the Turkish admiration of Mustafa Kemal Atatürk. His mausoleum stands on top of a hill in the heart of the city surrounded by a large park, and smaller statues and pictures of him are abundant everywhere in Turkey. Atatürk was the first president of the country for 15 years in 1920's and 30's and implemented a shocking number of modernizations, including reforming the alphabet, giving women a right to vote and separating church from the state. Some of the changes must have been controversial at that time, but nowadays nobody seems to have a single bad word to say about him — at least not publicly. Partly it's a taboo: you'd need to have guts to criticize a man who has been given the name "The Ancestor of Turks", but he's also honestly greatly respected by the majority of people. However, the number one reason for me to come to Ankara was to get my visa to India. I first went to the Finnish embassy to get the silly paper I mentioned in my previous blog entry and got ripped off 30 euros for that. To make the Indian visa officer satisfied still required a bank statement printout and a couple of photocopies but yesterday they accepted my application. I should be able to pick up my visa next Friday, but won't rejoice until I have it in my hand. To send my best season's greetings to all the readers of my blog I prepared a Christmas and New Year card (also available in Finnish). If you can read Finnish, you might also enjoy the extensive report of the Riga–Warsaw section of my trip, which is now online. Enjoy your holidays if you have any, get some rest and have fun in year 2007! 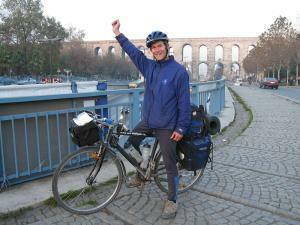 The last few hundred kilometers took time, but now I've finally arrived in Istanbul. Actually it happened already four days ago, but I didn't rush to write in the blog right away. The first couple of days in the city were spent mostly taking care of practical things such as washing clothes, reading email and checking out visa requirements and transportation options to next countries. I'm planning to go to India, erte is heading towards Northern Africa and Emile will return to Belgium, spending some time in warmer regions of Turkey or Greece first, however. Getting a visa to India turned out to be a bit more complicated than expected. It took several phone calls and some 90 minutes of queueing to find out what is actually required, but now I'm a bit wiser. There is an Indian consulate in Istanbul which accepts visa applications, but as an attachment they require a letter from Finnish consulate which certifies that my passport is valid and I'm the holder of it. Kind of silly because such a letter would be far easier to fake than the actual passport, but that's what they want. They even showed me an example of a such letter for a French person who had been granted a visa through the same consulate. The Finnish honorary consulate in Istanbul is not authorized to write such a letter and it apparently cannot be handled by fax either, so I need to travel to the embassy in Ankara about 450 km away to get that precious piece of paper. When traveling to Ankara I'm also planning to visit Cappadocia, an area of unusual natural landscapes and underground cities about 200 km south-east from the capital. I'm naturally also planning to see a bit more of Istanbul, so I will still have something to write before leaving Turkey. When I started my tour and people were asking how far I'm going to ride my bike, I said I'll go first to Istanbul and reconsider there. Now I'm quite confident that I want to continue, although the countries will become less bike-friendly and I will be using other ways of transportation more than up to now. The total distance from Helsinki along my (certainly not the shortest) route was 6349 km, with an additional 170 km of cycling in Moldova using Serj's bike. Istanbul is my last stop in Europe, Asia begins on the other side of Bosphorus which divides the city in half. I've also already been on the road for half a year now (well, tomorrow to be exact), so it nicely marks the end of the first half of my trip. The second half will be in Asia. 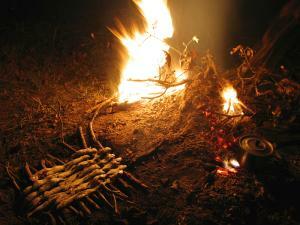 When approaching Istanbul we started making campfires more often than earlier during the trip. In many places forest was being cut and tractors were transporting small logs away so there were also usually plenty of loose pieces of wood available. The fire not only provided a welcome source of heat during chilly nights, it also gave better opportunities for cooking than the usual small pot on top of a gas cooker. It became dark already around five o'clock so we had plenty of time during the evenings. By the Black Sea coast in Kiyiköy we bought two kilos of small fish, cooked half of it while staying in a pension which had a kitchen, and saved the rest for the following night. 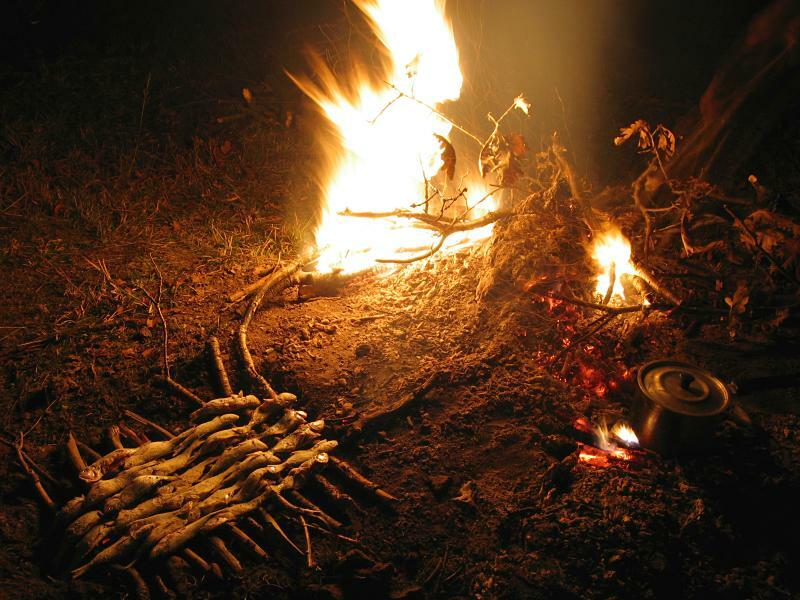 At our camp we covered the fish with a flour and spice mix and slowly grilled them on a grill which Emile prepared with wooden sticks. Although you cannot see it in the picture, there are also hot charcoals under the fish. Complemented with potatoes baked in the ashes, butter, salty cheese and fresh vegetables it made a delicious meal. That's how we celebrated the Finnish independence day, by the way. Emile also showed us how to make pizza and quiche lorraine (a french pie) outdoors. The pizza we prepared on a heated stone while for the quiche lorraine we found an abandoned metal grill at a picnic site and used that. Our staple food on the trip has been rice, which is easy to prepare on the gas cooker and make tasty with spices, fresh vegetables and occasionally some meat. Pasta is even faster to cook, but rice is more filling for the same amount of food. In the mornings we usually eat bread, cheese and yogurt (adding mysli, jam or whatever we happen to have available to the mix) and drink tea. Of course we also go to local restaurants to taste what each country has to offer. At least for me, that's an important part of the travel experience.